Visits: 35620 persons viewed this recipe. 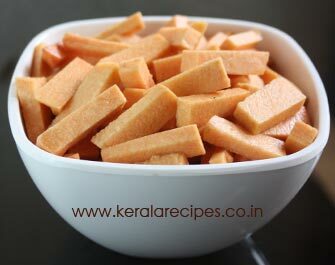 Elephant foot yam (chena) is a good source of omega 3 fatty acids which are known to build up good cholesterol levels in the blood. 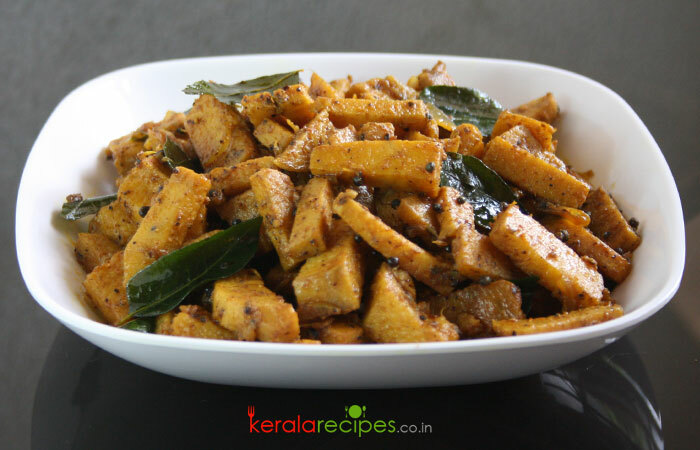 Here is the recipe of Chena Mezhukkupuratti (Elephant foot yam stir fry) which is a good accompaniment with rice. Try it and post your valuable comments. Slice coconut and shallots and keep aside. Heat 3 table spoon of coconut oil in a non-stick pan and put mustard seeds. When it splutters, to this add sliced coconut and shallots. Saute it till the shallots turns golden brown. Reduce the flame and put coriander, chilli and turmeric powders into it and stir well. To this add yam, curry leaves and salt. Combine well. Cook it covered (about 12 minutes) by adding ½ cup of water on a low flame till done. Open the lid, put ½ tea spoon pepper powder and cook it for 1-2 minutes to make it dry. Stir it occasionally. Taste for salt. Remove from the flame and transfer the chena mezhukkupuratti to the serving dish. 1) Garam masala (1 pinch) can be added for better taste. 2) Take care to wear gloves or grease your hand with oil before cutting elephant foot yam (chena) as sometimes it may have itching sensation. You are welcome Gifty. Thanks a lot for your kind words of encouragement. Please like the facebook page for the updates. Hope to see you here often. Thank you so much, you really help me. You are welcome Sajna. Thanks for the comment. Hi Shaan, This dish is really a mouth-watering one. But i have one clarification, what is Shallot? Please explain. Narayanan, Shallot also known as small onion in India. In Malayalam it is called “cheriya ulli” or “kochulli” and in Thamil “sambar vengayam”. Thanks for the feedback. Thank you Shaan! I am a retired person who tries his hand on cooking very often. My grandchildren always insist on me cooking for them when they visit us. My main source of information on cooking is postings by people like you! Dear Koshy, It is so nice of you to cook for your grandchildren. Happy to know that this website is very useful to you. Thanks a bunch for your feedback. Veena, Thanks for trying Chena Mezhukkupuratti recipe. Glad you all liked it. Hi Shaan, Mambazhapullissery and chena mezhukupuratty are my fav combination. Both recipes I got from this blog. Pls post more simple recipes. Thank you Shaan!!! Shibin, Glad to know that you found your favourites here. I will try to add more quick and simple recipes. Hope to see you here often Thanks.